This recipe is a long-standing favourite from one of our in-house DIY Classes. We like to call these melts “kisses” because of the delightful way they fizz and dance across the surface of the water. They pamper your skin with moisturizing cocoa butter and invigorating aromas. 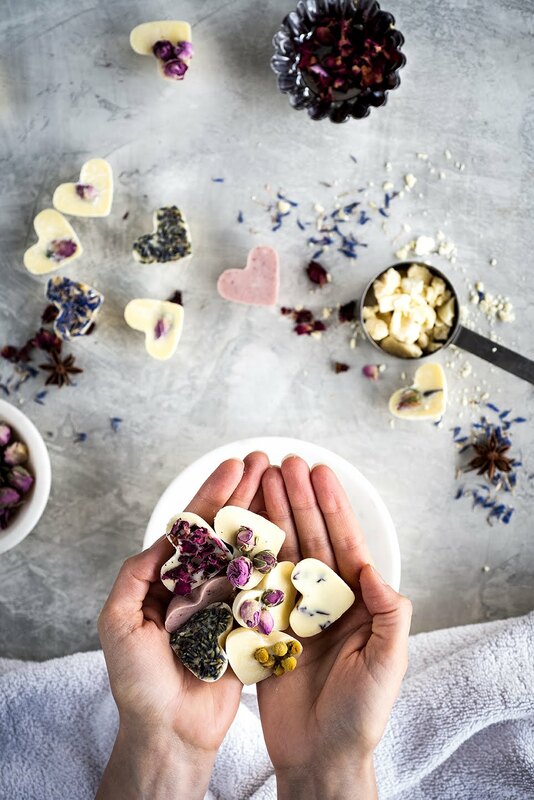 Makes an elegant and simple gift or a luxurious addition to your self-care bath time routine. In double boiler, melt cocoa butter on low heat, taking care not to overheat. Stir in baking soda, citric acid, cornstarch, and colourant if desired. Remove from heat and add essential oils of choice. Agitate the mixture so that contents do not settle, and pour evenly into mould tray. If desired, top with dried flowers for a decorative touch. Allow to cool completely before removing from molds. * Depending on the size of mold used. Drop kiss into warm bath. Essential oils and cocoa butter will melt into the water as the bath melt begins to fizz. Use caution when exiting the tub as oil may make surfaces slippery. For easy cleanup, wipe sides of tub with a cloth or paper towel once water has drained and tub is still warm.